Yesterday The Christian Alliance for Orphans hosted a conference call of over 40 organizations and churches to discuss, plan, and learn what could be done in Haiti by working together. The Haiti Orphan Relief Team (H.O.R.T.) is that plan in action. The team will deploy February 14th and updates from the team can be viewed on Facebook or Twitter . If you would like to see recent photos of the situation that the HORT team is going into click here: Haiti Photos . 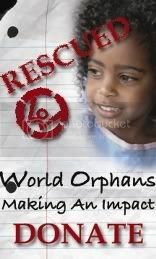 I am thankful that the ministry of World Orphans is part of the H.O.R.T. initiative. Please click on the links above to learn what you can do and please join us in prayer for our staff members who will be part of the team leaving for Haiti February 14th. I often wonder why it takes me so long to get things. I am not talking about the accumulation of stuff. That I am pretty good at and used to concentrate most of my waking hours refining my skill at doing so. I am talking about getting understanding about faith, social issues, politics, sin, family, my purpose, etc. It seems like I wasted a lot of time muddling around....not that I claim expertise in any of the afore mentioned areas. Sometimes I wish someone had just taken me aside and said "Look, this is the way it is!" Several probably did and I was just too busy getting the stuff that I thought I needed and didn't have time to listen. Slowly but surely I am starting to get the stuff that matters. It is amazing how much more meaning it has to me now. I suppose I am just a slow learner. I admire anyone with understanding of the really important stuff in life and particularly the ones who get it at an early age and dedicate themselves to helping others get it as well. Thank goodness Jesus loves us just the way we are but loves us too much to let us stay that way.